Walgreens Cashes In On Department Stores' Pain At the turn of the 20th century, visiting a drug store meant going to a soda counter with a pharmacist. If you wanted to go shopping, you would go to a department store. Now that trend is reversing: drug stores are battling to keep consumers in the store for longer. 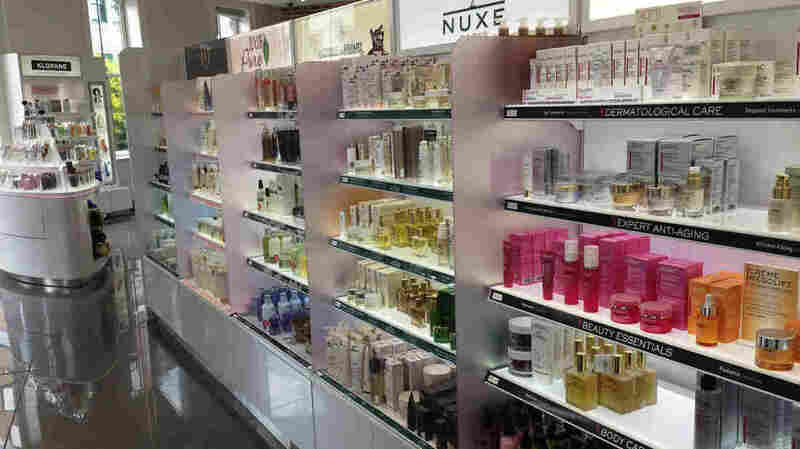 At the new flagship Walgreens in Washington, D.C., the beauty department features natural light and under-the-shelf lighting aimed at making the cosmetics look better. At the turn of the 20th century, drugstores were little more than a pharmacist and a soda fountain. If you wanted to go shopping, you went to a department store. Now, that trend is reversing. Department stores are suffering and drugstores are booming. So much so that Walgreens — one of the industry's leaders — is experimenting with expanding its goods and services. Publicity Move Or Something More? The three-story Walgreens in Washington, D.C.'s Chinatown district is one of 10 "flagship" locations. The 20,000-square-foot store has a health clinic with exam rooms staffed with a nurse practitioner, an extensive beauty boutique complete with a nail salon, and a cafe stocked with fresh food. 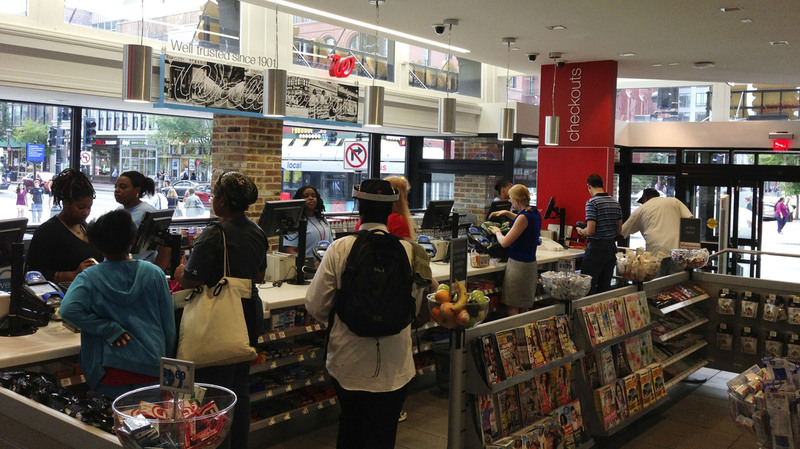 Customers check out at the new flagship Walgreens in Washington, D.C.'s Chinatown. The store is impressive, but it is not the future of retail — at least not in its entirety. Walgreens Divisional Vice President Beth Stiller says the retail chain places its flagship stores in heavily trafficked areas to test new features individually. "Flagship stores are really our playground," she says. "It's where the merchants in our business get to test new trends and innovations and new ideas and new product offerings. So it allows us to get to market quicker in more stores with new product lines." Stiller says Walgreens tests everything from new fixtures and products to entire departments in its flagship stores. Their strategic placement in populous neighborhoods helps generate sales data more quickly. This allows the company to roll out the ideas that work to the traditional stores more efficiently. But to get consumers to try the new products and services, Walgreens has to persuade them to spend time exploring the store. It is the same strategy department stores used to rely on: The more time you spend in a store, the more likely you'll pick up a few things that were not on your shopping list. "Now it's really about trying to figure out how do we make it one-stop multiple shop," says Marshal Cohen, a chief retail analyst at NPD Group, an industry research group. "In other words, offer the consumer all kinds of reasons to come into the store and ultimately stay in the store longer; the longer consumers stay in the store, the more apt they are to spend more money." 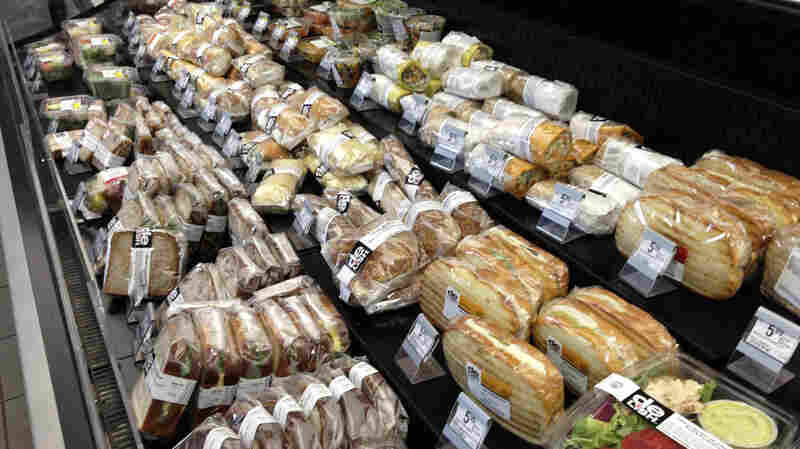 Walgreens is expanding its offering of fresh food options. Stiller says Walgreens has thought a lot about how to keep customers in the store longer. Every aspect of the D.C. store — from the in-store services to the lighting — serves this goal. Walgreens starts creating what Cohen calls "a lifestyle center" by making sure the content of the store fits the surrounding community. In the case of the D.C. store, the midday population of Chinatown is a mix of business professionals and tourists — two groups who want quick access to food. Stiller says Walgreens responded to this by putting a cafe stocked with fresh food options as close to the door as possible. In the entire floor devoted to beauty there is a big emphasis on natural light. The soft, pink glow of the floor helps makeup look more flattering — and there is a team of smartly dressed beauty attendants to help you find your shade. The big windows are completely unobstructed to make the most out of the natural light. Stiller says the store also uses undershelf lighting in the cosmetic and over-the-counter medication aisles to help customers read the packaging more easily. Stiller says all of these little changes make the shopping experience more comfortable, and this creates an environment that people want to spend time in and return to, leading to bigger sales. The Walgreens flagship store looks and acts like a department store. The early allure of department stores was their wide product selection and pleasant atmosphere. Shopping was a form of entertainment. In the 2000s, department stores started losing customers to big discounters like Wal-Mart and Target. Walgreens sees the trend as an opportunity to take a bite out of that market. Its strategy is to replicate the convenience and affordability of big-box stores while mimicking the pleasant shopping experience of a department store. Cohen, the analyst, says this plan is consistent with the shake-ups in the retail industry. The recession and the popularity of online shopping have meant that to get customers in the door, brick-and-mortar stores have to sell a memorable experience. Cohen says big retailers "are exploring how to do it smaller and the smaller ones are trying to figure out how to do it bigger. So this is really about everybody trying to find growth and give convenience and services to the consumer to get them to come in, stay in and spend money," Cohen says.